As we mentioned last month, our partnership with Shane’s Inspiration helped us bring the first inclusive playground to Ecuador! On Friday, Nov. 22, Paúl Granda López, Mayor of Cuenca, our president, Pat Faust, and the team from Shane’s Inspiration celebrated the grand opening of the 8,880 square-foot inclusive playground. The event welcomed more than 200 children of all abilities, many who were experiencing swinging and playgrounds for the very first time in their lives! Former Vice President Lenin Moreno, an extraordinary champion for the rights of people with disabilities, initiated the concept of the inclusive playground, inspired by his own personal journey as a paraplegic and his discovery of the healing power of laughter and play therapy. Read more about the inclusive playground in Cuenca as well as the social inclusion workshop that Shane’s Inspiration held for more than 80 university students majoring in special education. 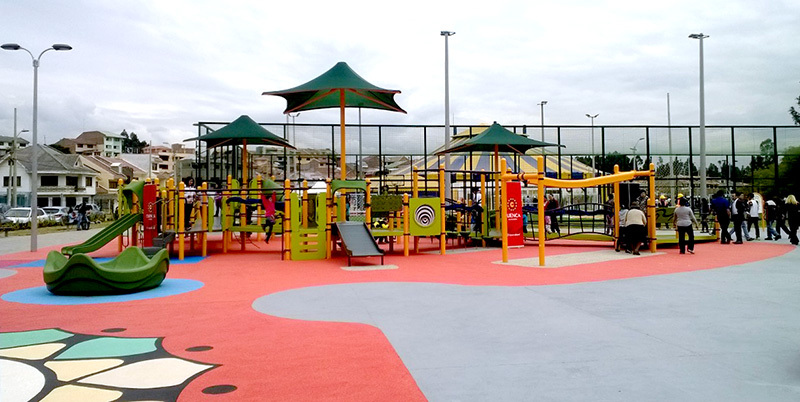 This entry was posted in Inclusion, Inclusive Play, Inclusive playgrounds, Sensory playground, special needs and tagged Cuenca, Ecuador, Pat Faust, playground, Shane's Inspiration, social inclusion by PlayLSI. Bookmark the permalink.